Amid today’s heady and realistic games, lightweight '90s-era FPS action is refreshing. Back in 1995, Toy Story wowed audiences with sophisticated computer-generated animation. That same year, games studio Parallax released Descent, blowing players away with some of the first truly 3D, omnidirectional gameplay. Things have moved on a lot since then, but the classic game's creators, Parallax co-founders Matt Toschlog and Mike Kulas, are ready to stage a revival. 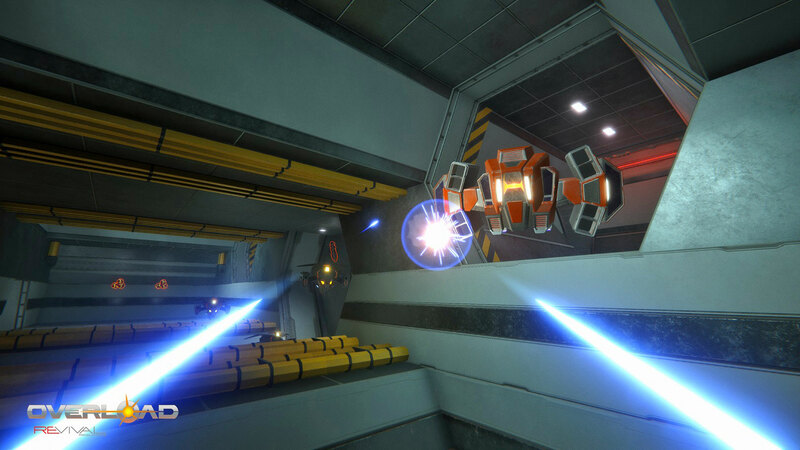 Today, they've released Overload, a spiritual successor that brings back the zero-G combat that redefined first-person shooters (FPS) two decades ago. For those who have never played Descent, Overload puts players in the cockpit of a starship capable of moving in all directions and thus adding verticality to standard FPS gameplay. In 1995, it was revolutionary. Today, you can play plenty of space simulators that do the same. So the Overload devs made sure to replicate what defined Descent and its two sequels, and what is still unique today: packing players in tight corridors to constrict their free-flying movement and transforming battles into maddening close-quarters space combat. Overload lead designer Luke Schneider told Engadget that the team had to update the gameplay and choose both what to retain and what to ditch. "We only tried to preserve the really positive aspects of Descent's gameplay in Overload. Overload is more like what you remember Descent feeling like than what it actually was, similar to how Doom 2016 feels like an old-school Doom but modernized," said Schneider. The comparison is apt. Doom and Wolfenstein 3D were both landmark titles that changed gaming forever, and both have had wildly successful resurrections that kept the best parts of their gameplay intact. In Overload's case, this means letting go of the temptation to expand into fully explorable space -- games like Everspace and Strike Vector have already done so, Schneider pointed out -- and deliver a tight, balanced and claustrophobic shooter experience. Overload hasn't reimagined Descent's gameplay as much as heavily refined it, perfecting the weightless feel of navigating in zero-G along with crisp sound design to give players a solid grip on their surroundings -- and where their enemies are shooting from. The usual 2018 technical upgrades are all here, like HDR rendering, dynamically lit environments and a voice-acted narrative, and it makes for a very polished reimagining of the classic. The result is a liberating one. The original Descent's free-flying gameplay freed players from the glut of two-dimensional Doom shooter clones but still kept the same industrial brown-and-gray color palette that dominated games in the early '90s. It's a grim look that makes revisiting old titles difficult now that I'm used to the gorgeous, dynamic environments of today's games. Overload, on the other hand, is full of vibrant textures layered with plenty of light, shadow and neon, which adds much-needed personality to the game's small areas. Going back to the simple tight-quarters combat of yesteryear is a lot more fun than I expected. Fights are stripped to the essentials, pushing me to desperately outfly endless enemies, eking out the last possible space between my ship and the walls to dodge enemy shots coming from every direction. Overload hearkens back to the days of lightweight arcade combat, something this genre has avoided as flagship titles layer on realism and heavy narrative. By the same token, it will probably be too simple for other players. Despite carrying over upgrades between runs to encourage replayability, the core combat loop probably won't hold my attention as long as more-complicated, weighty games. But if I want that quick-and-dirty shooter action, Overload is one of few titles today that I could load up quickly to scratch that itch. "Shooters have evolved a lot, but that evolution has left some gaping holes in its wake. Doom 2016 proved there is a desire for different (non-evolved?) styles of gameplay in the modern world," said Schneider. Schneider and others on the Overload team, all of whom worked on the original Descent games, aren't the only ones trying to revive its zero-G gameplay. A group of other developers, including Star Citizen's Eric Peterson, bought the franchise's naming rights and ran a successful Kickstarter in 2015 to create Descent: Underground. Despite a brief period in Early Access on Steam, that game still hasn't come out. There doesn't seem to be bad blood between the teams. Overload was successfully crowdfunded a year later, and on the campaign's FAQ page, the developers stressed that their title and Descent: Underground "are completely different games from different groups of people, but we all love 6-degree-of-freedom shooters." Overload is out today for Windows, Mac and Linux for $30, but the promised PS4 and Xbox One versions will be delayed by a couple months. It launches with multiplayer and VR support, which round out the modernization efforts. What's left is a sleek gateway to a time before streamers and battle royale, loadouts and aiming-down-sights.